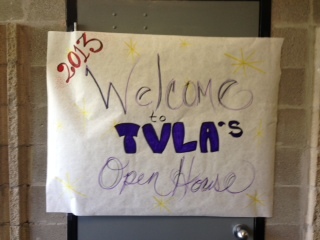 The open house at the TVLA was well attended. 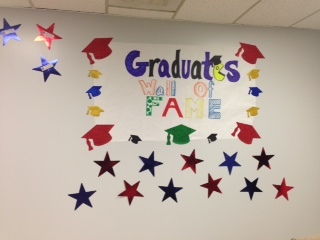 Right now, there are 14 students who will walk at the Taylor School District graduation ceremonies because of their accomplishments in this program. From a personal point of view, it was so impressive: Every student who entered the door with their parents were greeted by their first and last name. The relationships with students that have been formed from Project Manager Pat Scott and each mentor was a phenomenal thing to witness! You never know, Taylor might have another John Pierpont Morgan in its midst. The First Community Federal Credit Union, located in Southgate, is running a partnership with Taylor Parks Elementary School to help students understand the value of the "earn, save, spend" philosophy. The credit union assists education by helping students open and operate student-run credit unions within their buildings. That type of activity can turn the world of finances into reality for the pupils. 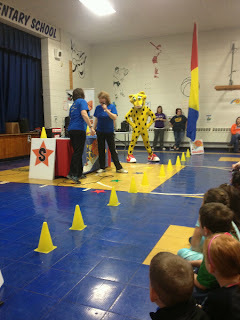 Participation in the program teaches life lessons in savings and finance, all using real money. At Taylor Parks, the bank is run by fifth-grade students under the direction of Maryann Hammons, First Community Federal Credit Union relations coordinator. Many of the student depositors have accounts that dave back to their first year as kindergarteners. 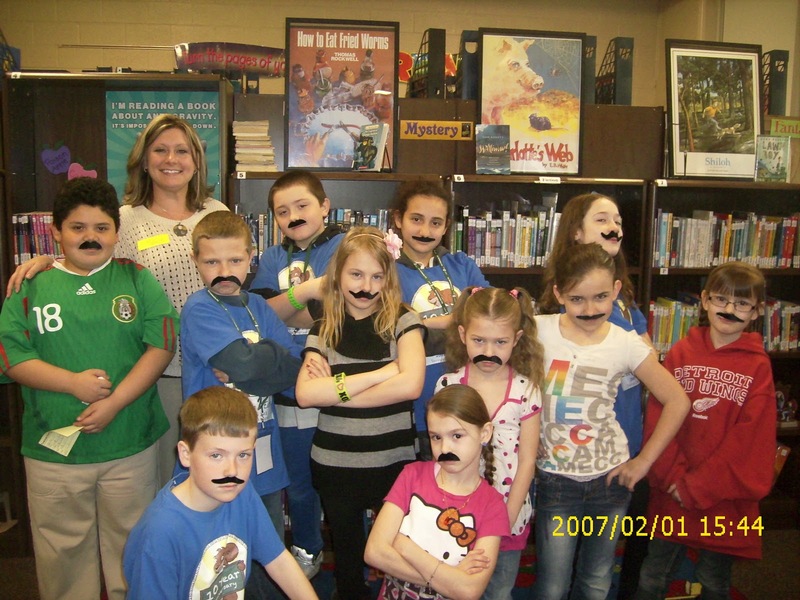 To show that banking can have its fun moments, the credit union student employees and depositors wear moustaches to help encourage students to "stash their cash" as part of National Credit Union Youth Week. You never know what can happen down the road. J.P. Morgan (1837-1913) ended up dominating the corporate financial and industrial world during his time, and was one of the key figures in American history. Could Taylor Parks Elementary School turn out another J. P. Morgan? Are you looking for just the right gift for Mother's Day? Hoover Middle School might have just the right thing for you! 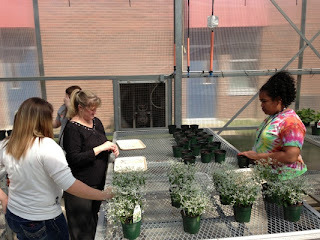 Hoover is lucky enough to have a fully functioning, professional greenhouse. 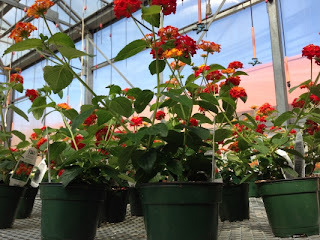 As you can see by the photos published here, the students in the school have been working hard to keep these beautiful plants happy and healthy, so that they can be ready for Mother's Day. The school will be having a sale that is open to the public. 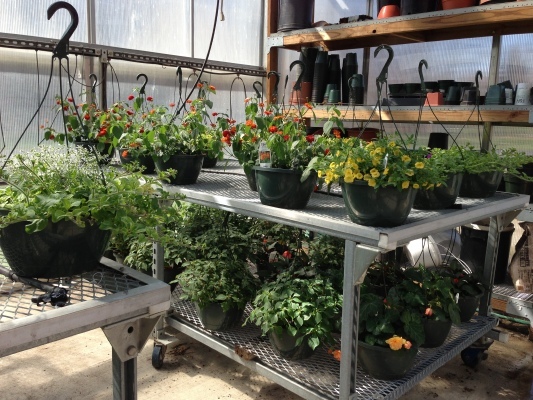 For sale will be annuals and vegetables, as well as baskets. The Mother's Day Sale will be from 9 a.m. to 4:30 p.m. May 8 and 9 at the greenhouse. Available will be Proven Winners Flowers, individual veggies are $1 and individual annuals are $3. Baskets are $13. Hoover Middle School is located at 27101 Beverly. 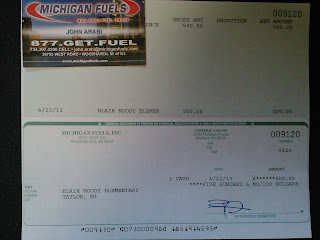 Call (313) 295-5775. 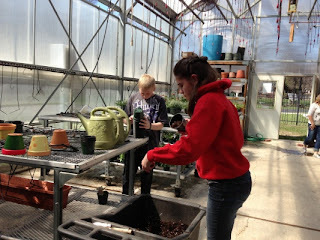 For more information about the program, click on the school's Web site here. 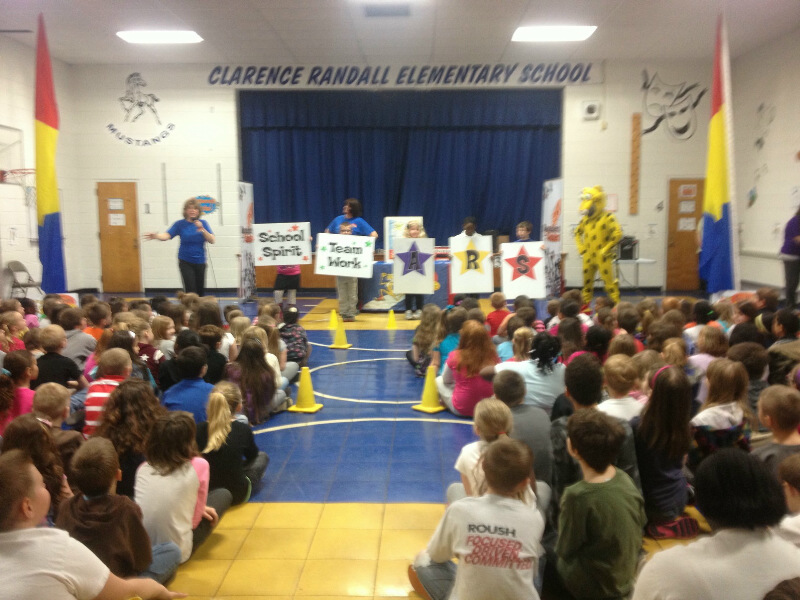 Randall gets movin' on some important fundraising! Randall Elementary School has started an important campaign in an effort raise money for key events and programs in the building. 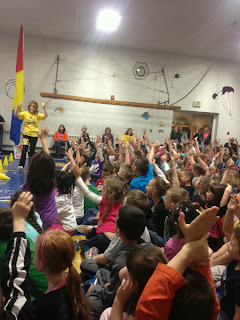 The event kicked off with an assembly April 19. The Randall PTO is attempting to raise money to fund fun day, various assemblies, classroom enrichment and much more. According to Kelly Szwed, those interested have teamed up with "The Get Movin' Crew" to make the campaign fun and profitable. Each grade will wear a representative color on a designed special day, which is scheduled for May 10. 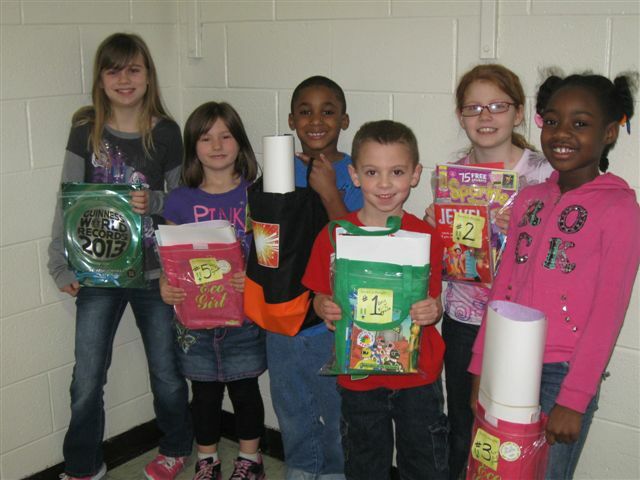 Students are encouraged to raise $50 each. Donations are accepted in person and through student Web sites provided by "The Get Movin' Crew." Each student who reaches his or her goal (or goes beyond it) receives exciting prizes such as McDonald's gift cards, PTO prizes and raffle tickets for a Kindle Fire or iPod Touch. 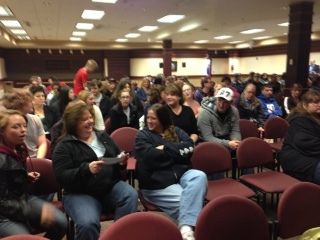 Those students who raise $400 attend a special breakfast with Principal Meszaros. The Top 10 students will earn two passes to the Zap Zone. And the top two fundraising students from each class will have the honor of turning Mrs. Meszaros into a "human silly string ball" as part of Fun Day. If Randall reaches the school goal of $12,000, everyone will receive a move and popcorn day. The best part of the event is that Randall pupils are learning to stay active each and every day. That keeps the mind and body healthy. Remember, "Together, Everyone Achieves More!" Practice sound lifestyles and learning because that is what T.E.A.M. really means. For more on "The Get Movin' Crew" program, click here. Randall Elementary School participated in the recent district-wide "Language and Literacy Luau" at Kennedy High School. 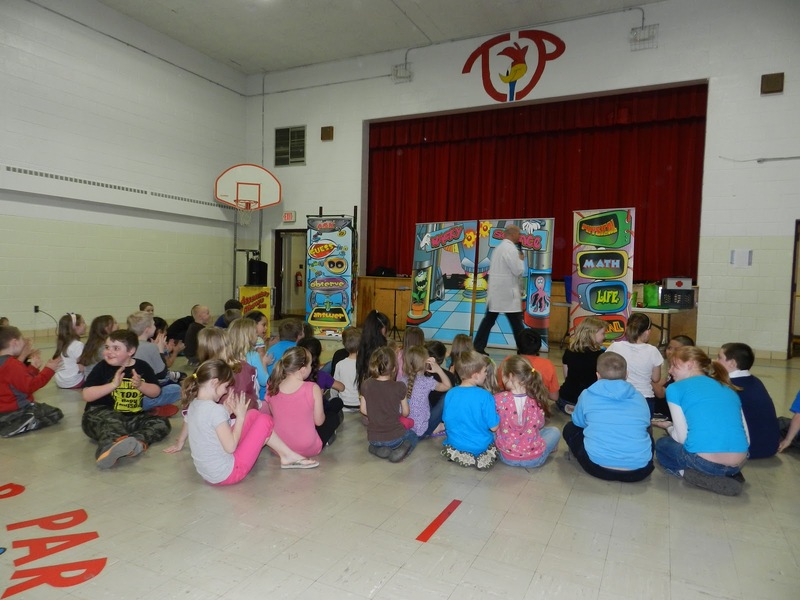 Held April 17 and sponsored by the district's Title 1 Department, it attracted over 700 people and was deemed a big success by all who attended. 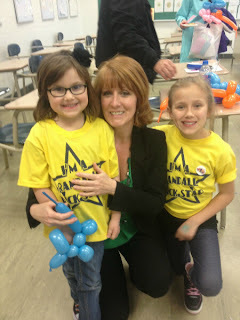 According to Randall's Kelly Szwed, Randall had two school representatives in attendance during the evening, which included parental education sessions, display booths, food and plenty of fun activities. The story about the controversial statewide "skunk works" project involving the creation of lower cost schools (posted yesterday here on "Talking Taylor Schools") has taken a new turn. 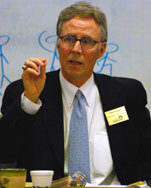 The secretive education panel will be taken over by State Superintendent of Public Instruction Mike Flanagan (above), according to reports. Gov. Rick Snyder agreed to Flanagan's request that the group start over in an attempt to be as transparent as possible on the issues that it is dealing with. 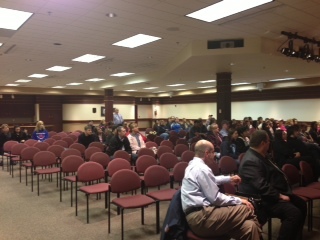 The group is discussing ways to recreate Michigan's schools including lowering costs and adding technology. For more, click on the Detroit News story by Chad Livengood here. 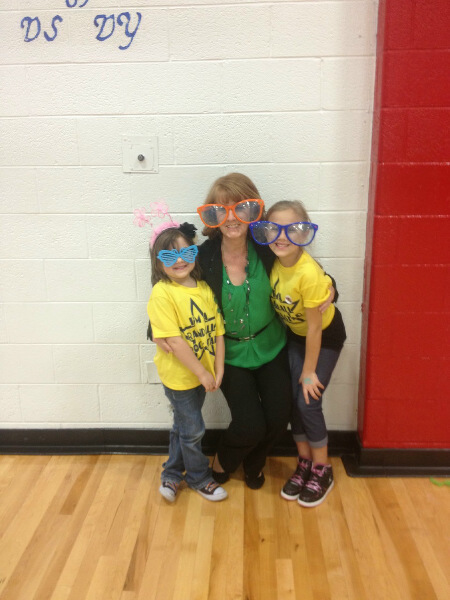 'Talking Taylor Schools' celebrates 6,000 visits this year! 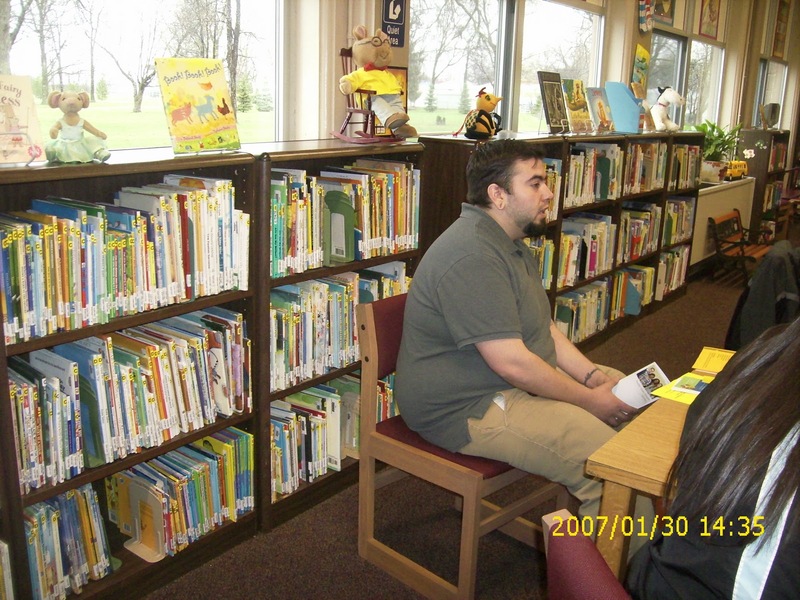 The "Talking Taylor Schools" blog recently went over the 6,000-visit mark. Thanks to all who have been clicking in from time to time! Also, thanks to the staff and teachers in the system for sending stories and images to be posted. Without their help, the blog would be dead in the water. 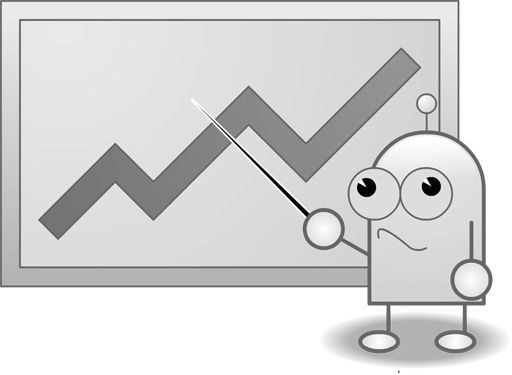 For the month, we're over the 3,300-visit mark and we're headed toward 130 total blog posts. If you have anything you'd like to see posted, don't hesitate to email Karl Ziomek at karlziomek11@gmail.com. Any and all comments are also welcome. 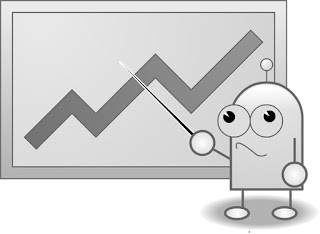 By the way, that's me in front of the graph (above) before my morning coffee! Blair Moody Nation sends out a big 'thanks' to John Arabi! The staff and teachers at Blair Moody Elementary School would like to remind everyone in the community that John Arabi is a really, really great guy. For those who don't know Arabi, he owns and operates the Exxon Mobile gas station at Wick and Pelham roads. 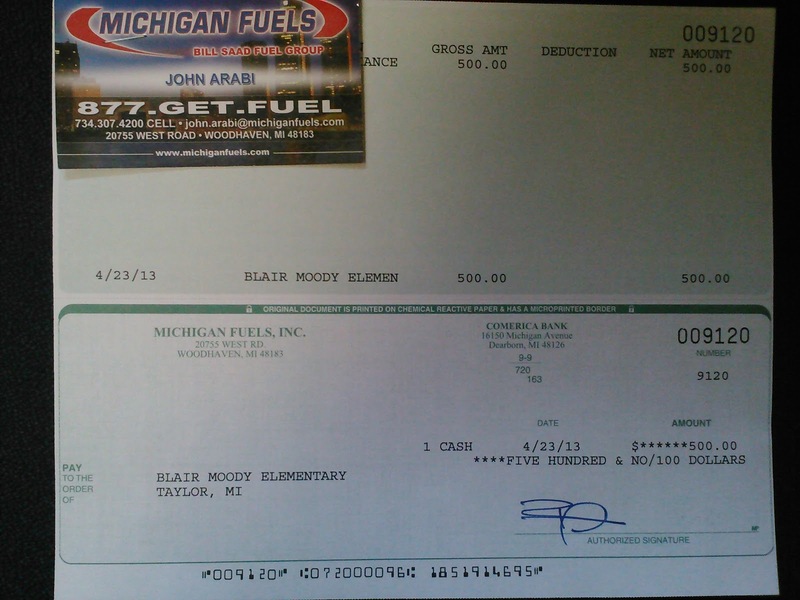 He recently donated $500 in support of math and science at Blair Moody. Staff is very grateful for the support and wants to remind everyone to make sure that they support businesses in the community that go out of their way to donate to benefit children in the Taylor School District. And John Arabi is that kind of man! There's nothing like a good partnership to make a great idea a reality. And that's just what happened recently between teachers and staff at Myers Elementary School and Masco Corp.
Sue Szabo, a Masco representative, visited the school in October. 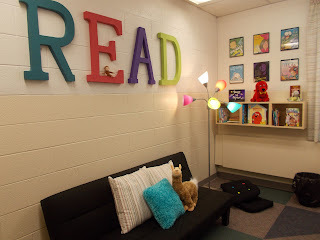 She asked staff if they had any projects in the works and Susan Oswald (Myers' reading specialist) and Marilyn Vargo (Myers' social worker) pitched an idea for a new student reading lounge in the building. Hence, the "Reading Lounge or Die Trying Committee" was created. 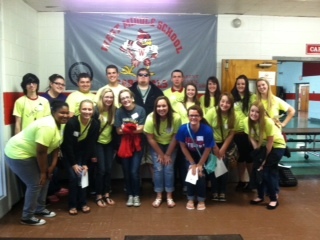 Masco donated $1,000 to the project and teachers and staff at Myers donated another $200. 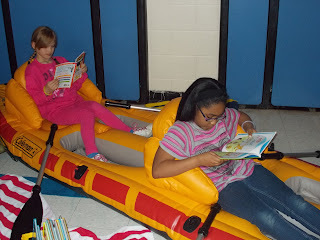 The result was a beautiful new room focused on reading. 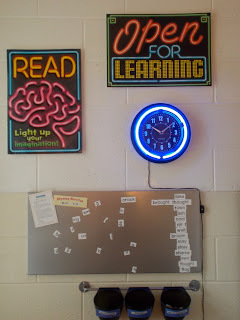 The intention of the project was to create a place where pupils could find direct access to current, high-interest literacy mediums -- as well as some old-fashioned comfort. The result was an environment for learning and will foster a love for reading. The room is an inviting, student-inspired space filled with a variety of literacy materials including favorite characters, pop-up books, story boards, magazines, a listening station, two Amazon Kindles and an iPad. Children are encouraged to go in and explore ... wonder ... or just read. "We are very proud of the positive impact the lounge has had on our students," stated school officials in an email release on the subject. "We were honored to recognize members of our school and community who made the project possible." Students and families at Taylor Parks Elementary School received some fun with their science, thanks to a recent visit by Mr. Science, Doug Scheer. Mr. Science focuses on the subject through everyday objects and makes scientific methods easy to understand. And his show puts science in the hands of students, who help him onstage. 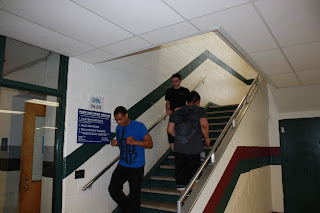 Before the performance, everyone on hand munched on food from Mancino's and drank some refreshments. 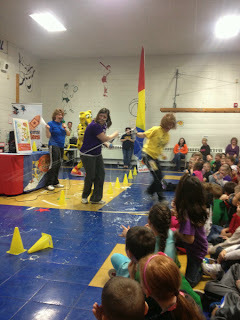 According to school staff, a fun time was had by all! 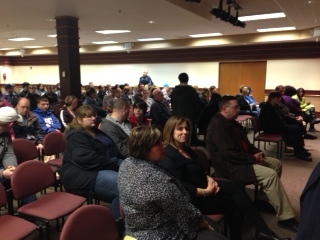 Nearly 200 students and families attended a meeting and filled out applications at Wayne County Community College's Downriver campus yesterday in preparation for a unique partnership between the college and the Taylor School District that is scheduled to kick off in the fall. One hundred and 16 student juniors-to-be from Kennedy High School and another 72 from Truman attended the event, which was held in the Ray Mix Building on the Taylor college campus. This will be the first year for the program, which offers classes and college credits to students who are attending Taylor schools. 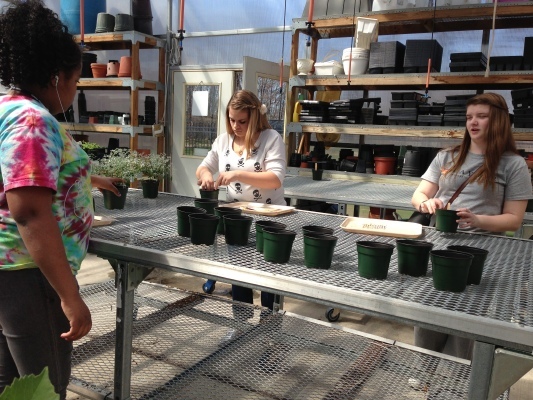 Students, beginning as sophomores, will be able to take part in the program, which offers eight specific college courses starting in the fall of this year. The courses are paid by the TSD. The only financial obligation to the students and their families are the cost of textbooks. The school district will pay for the classes and fees, which is a savings of $368 per class per student, or $2,944 for all eight classes over the two-year period. The partnership involves taking two college courses each semester at WCCC. In the plan, the courses would take place after third hour in the high schools. Participating students would eat lunch and then be bussed to the college campus. The college courses would end at 2:30 p.m., and which time the students would be dismissed for the day. While the students will be bussed to the campus, families will have to provide their own way home after the day is over. The advantages of the program are many. The college courses would apply to the student's high school transcript and be counted for high school graduation. The credits would apply to about 70 colleges and universities in Michigan, including the University of Michigan (Ann Arbor, Dearborn and Flint), MSU, CMU, EMU, WMU and Grand Valley State and Oakland. Courses required for successful applicants are speech, two English courses, psychology, American government, sociology, visual arts, and biology. All are worth three credits each, except for biology, which is worth four. In essence, this amounts to a "one-year scholarship" for those TSD students participating in the program. If successful, they will earn 25 college credits enter college after their high school graduation with a sophomore standing. This eliminates an entire year of college and saves students and their families a lot of money. 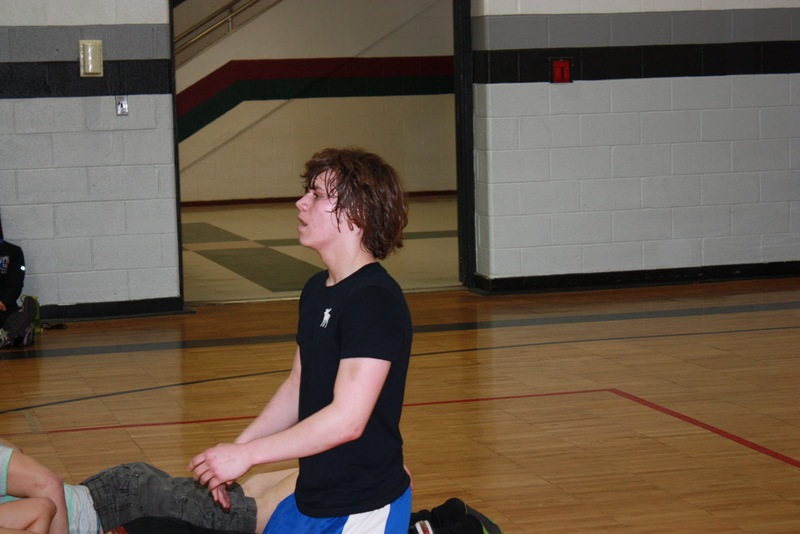 A key feature of the program involves keeping the Taylor students together during this partnership. They will not be mixed in with regular college students. Instead, they will attend classes together and travel together. 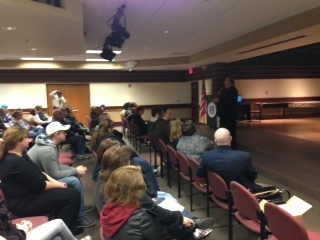 If you have any questions about the program, call the TSD at (734) 374-1200. 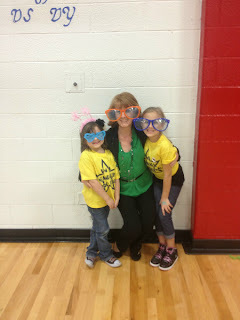 Camp Learn A Lot celebrates reading accomplishments at Myers! There's nothing like a camp to culminate any special activity. Pupils at Myers Elementary School learned that fact the fun way when they ended March is Reading Month with a "Learn A Lot" camp outing. 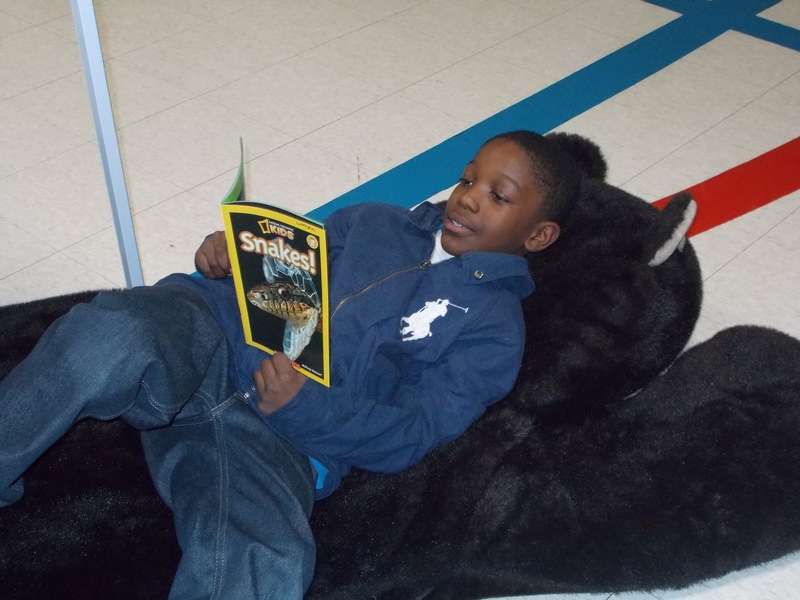 Pupils earned their way into the camp by reading and tracking various genres during March. 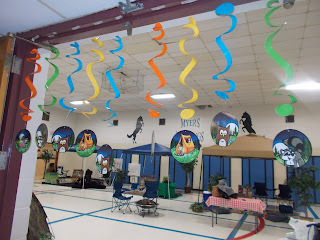 The school gym turned into a campground, where children were able to enjoy all the sights and sounds of regular camping -- although we don't know if any wandering owls flew in to see them! 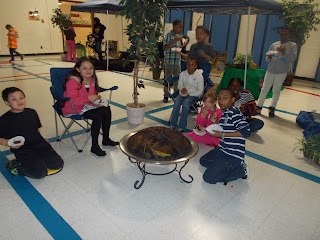 Highlights of the event included visited "themed" tents, eating plenty of s'mores, fishing for sight words, making key chains and viewing a short film that celebrated the month's achievements. Naturally, there were displays throughout the "camp." 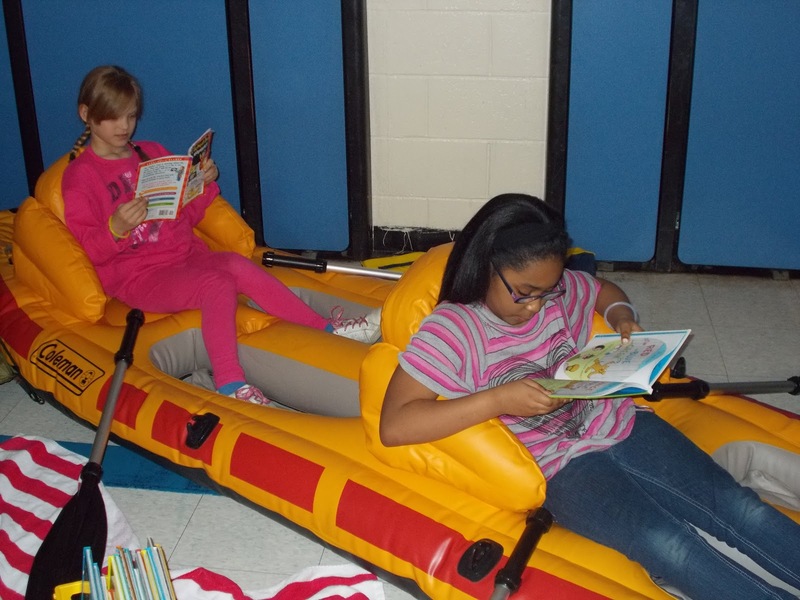 Overall, a grand way to celebrate reading! 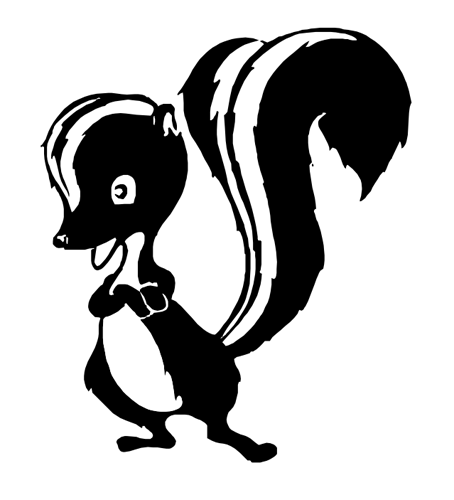 A state group developing a new plan for a low-cost school model for Michigan -- now commonly known as "project skunk works," has drawn plenty of media coverage and controversy over the past week. According to MLive, Gov. Rick Snyder, speaking last night during a virtual town meeting, said that public uproar over the secretive project overshadows the fact that he thinks the group may be on to something big. One of the group's main focuses involves getting more technology into the classroom. 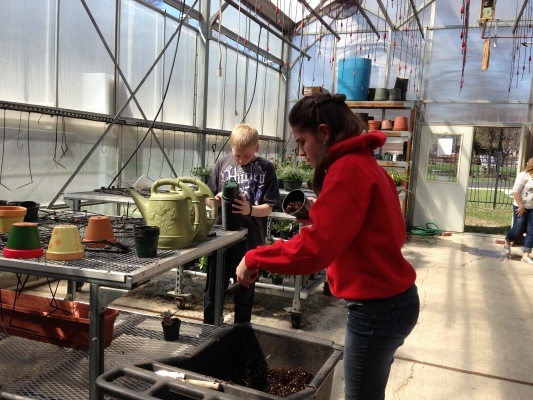 Visit the most recent Mlive story, by Jonathan Oosting, by clicking here. Visit a story in Yahoo! News, by Vanessa Evans, by clicking here. Visit a story from the Detroit News, authored by Chad Livengood, which centered on the "skunk works" voucher-like proposal of value schools, by clicking here. And visit a Detroit News story centered on Mike Flanagan, Michigan's superintendent of schools, who feels that the group should restart its efforts to gain transparency, by clicking here. "Time Out For Parents" is a Taylor Parks Elementary School program that focuses on community resources available to families in the school community. The program meets monthly, usually on the fourth Wednesday. They are hosted by Tania Hernandez, the Taylor Parks Elementary School Title 1 Elementary School Student Support Consultant. There is a new point of emphasis or topic each month, along with free giveaways and refreshments. 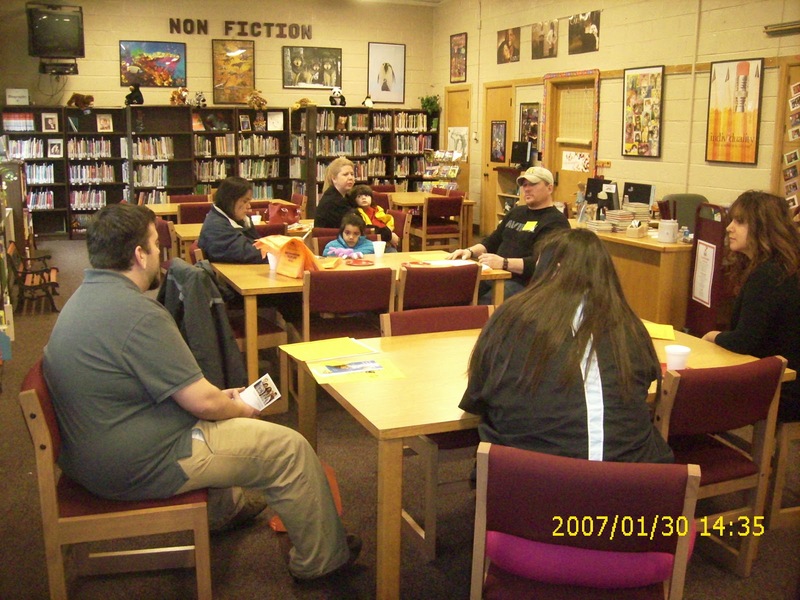 The most recent speaker was Rob Cox (pictured above), a representative from the Taylor Teen Health Center, who spoke to parents on issues that many of them are facing. The next meeting is planned for 9 a.m. May 22 and everyone is invited to attend. 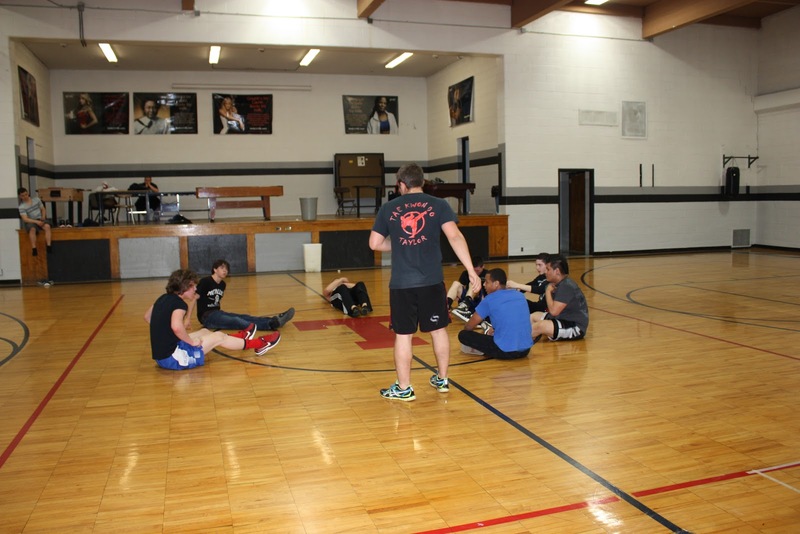 Instructors from the Heritage Martial Arts & Fitness Center put some TITAN Alternative High School students through the paces recently. 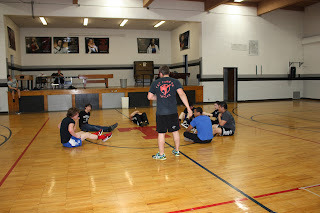 Students did a cardiovascular conditioning "Boot Camp" style workout under the club's direction. 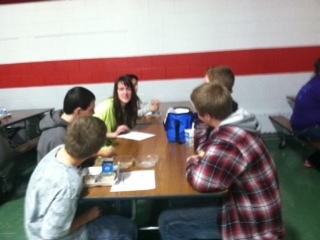 Counselors at West Middle School recently hosted their third "Mix It Up Lunch" with eighth graders in the building. The event brought in students from Kennedy High School's Link Crew to help facilitate the activity and get eighth graders ready for the transition to high school. The Link Crew discusses issues important to that transition and gives eighth graders a chance to talk to high school students about what to expect when they make that jump. The "Mix It Up Lunch" is designed to break eighth graders out of their regular social circle and promote new friendships and relationship. "Mix It Up" was designed by a group of teen activists that wanted to challenge social boundaries in their schools and communities. It is part of a national campaign launched by Teaching Tolerance. 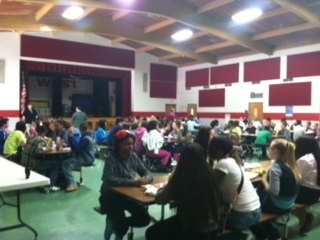 Surveys launched by that organization showed that the cafeteria is a place where divisions are most clearly drawn. 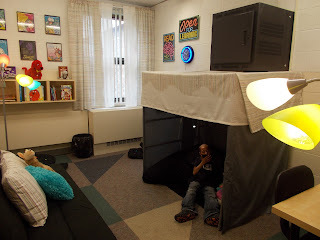 They then launched the idea of designating a day each year to ask students to move out of this "comfort zone" and connect with someone else during their lunch break. Those interactions can reduce prejudice and misconceptions. There are plenty of different models and examples to emulate. For more about the "Mix It Up" program, see the Teaching Tolerance Web site at www.mixitup.org. Myers' chorus a hit at the luau! 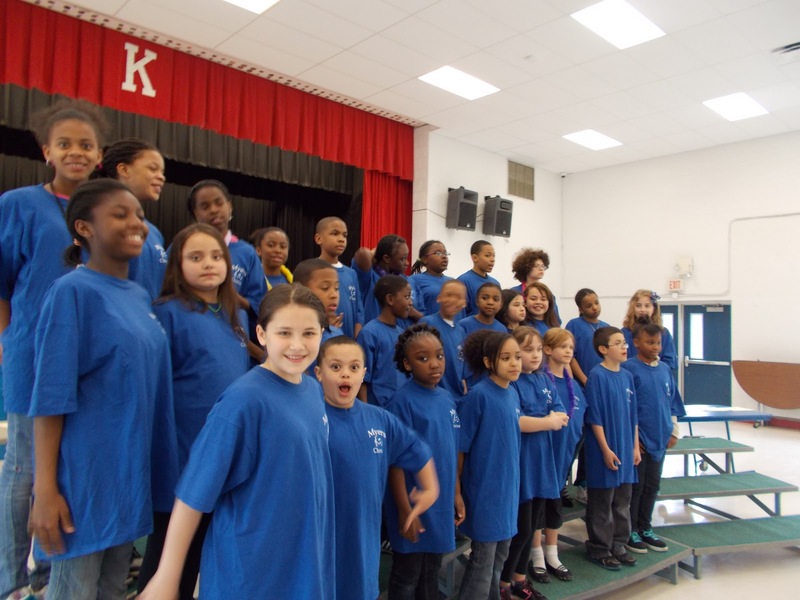 The Myers Elementary School chorus was invited to sing during the recent Taylor School District "Literacy and Language Luau" at Kennedy High School. 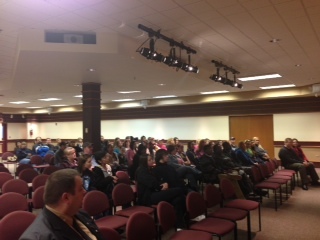 The event, attended by over 700, was sponsored by the district's Title 1 program. The group sang three songs: "Play That Music," "Music Is Always There" and "I Wish You Music." They performed under the direction of Music Teacher Leslie Burnett, who noted that they were outstanding and had a great time. No, these aren't the Temptations or the Supremes. 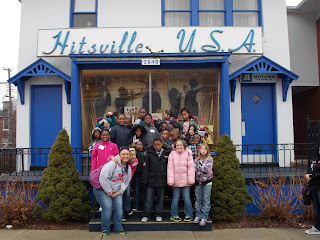 These are just third-grade pupils from Myers Elementary School visiting the home of the Detroit sound, otherwise known as Hitsville USA, the Motown Museum. The Myers' pupils traveled there as part of their studies on Michigan history. 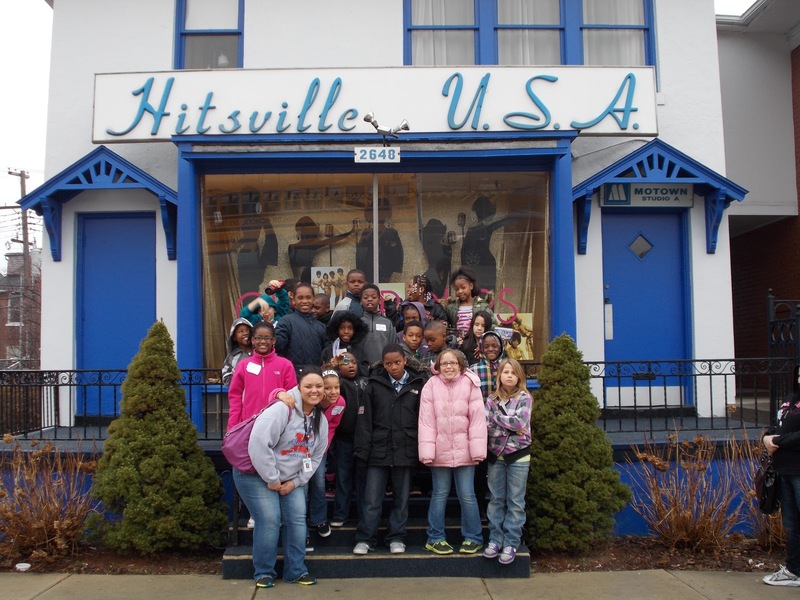 The Motown Museum is a historical landmark. 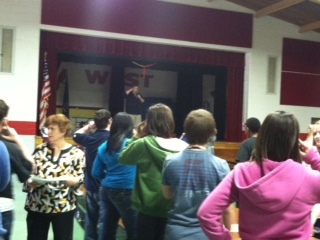 The students learned about how Motown founds its label were able to see the way the recording studio started. The record company was founded in 1959 by Berry Gordy. The name -- a simple combination of motor and town, which was also a nickname for Detroit. Motown played an important role in the racial integration of popular music by achieving what is widely known as crossover success. In the 1960s, Motown and its soul-music-based subsidiaries were the most successful proponents of what came to be known as "The Motown Sound," which was a style of soul music with a pop influence. Some examples of the Motown Sound? How about Smokey Robinson and the Miracles, The Temptations, The Marvelettes, Diana Ross and the Supremes, The Four Tops, The Jackson 5 and Stevie Wonder. 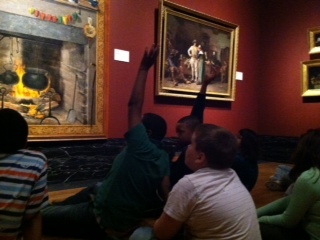 McDowell Elementary School third-grade teachers Michelle VanDerworp and Elizabeth Bochenek led their students on a field trip to the Detroit Institue of Arts on April 18. 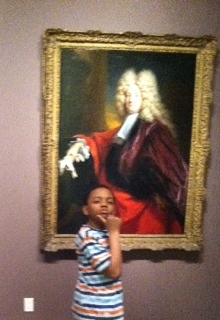 Students participated in a new program, "Thinking Through Art," which incorporates visual thinking strategies. These strategies develop critical thinking, communication and visual literacy skills. 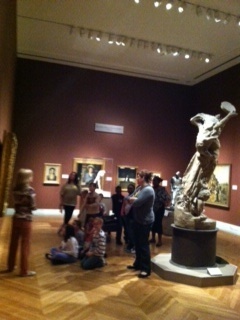 Children toured the museum with specially-trained volunteers who facilitated learner-centered discussions of visual art. 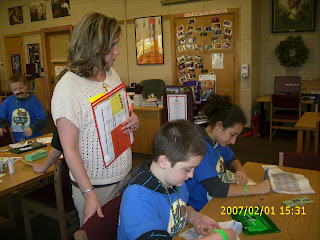 The volunteers engaged the children in a rigorous process of examination, according to the teachers. The discussion enabled students to practice respectful, democratic and collaborative problem-solving skills used in the classroom and beyond. Through this participation, verbal language skills are nurtured, which then can transfer to written abilities. The students didn't realize all of this, right away, of course. 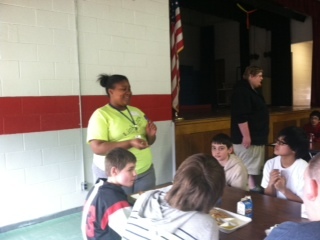 All student Angel Johnson said was, "It was awesome!" Photographed above at the winner of McDowell Elementary School Librarian Mrs. Cline's March is Reading Month Raffle! Thanks to everyone for participating in the effort. A pie in the eye, for reading! Kinyon dancers are real sweethearts!